If you have ever experienced HighEdWeb before then you already know why Higher Education web folk are already in a flap! However, if it’s your first time then you may be wondering what the fuss is all about. Surely it’s just a conference…or is it? We have joined forces with mStoner to give HighEdWeb attendees an exclusive insider look at the redesign of LMU’s brand spanking new site. When: Tuesday, October 6 from 9:30 a.m. – 10:45 a.m.
For Loyola Marymount it was time to rethink and reimagine LMU.edu. They wanted to design a digital experience that would reflect the university’s unique academic quality, location and Jesuit foundation while also showcasing their gorgeous campus. They also wanted to create a framework that would allow their website to tell the LMU story through images, video and text. The LMU team worked with mStoner, Inc, and TERMINALFOUR to rebuild the website from scratch and develop a roadmap to extend the brand new interface through the LMU domain. Join us on Tuesday to hear about some of the challenges we overcame, the strategy and the solutions we put in place to arrive at the university’s new responsive design. Obviously we’re biased but this is one presentation you won’t want to miss. What can we say; HighEdWeb brings out the best in us! We will be giving away a veritable smorgasbord of covetable prizes throughout the duration of HighEdWeb. To be in with a chance of winning simply drop by the TERMINALFOUR stand and you could be walking away with a FitBit Surge or your very own Apple Watch. 3. Feeling left out because you can’t make it? Can’t make it this year? Feeling left out? Keep an eye on all the highlights on #HighEdWeb15 on Twitter. It’s the next best thing to actually being there….we promise! Did we mention Bill Nye- Scientist, engineer, comedian, author and inventor is Monday’s keynote speaker? Grab your seats early because it’s guaranteed to be unmissable! Look it can’t all be about learning from the best and brightest from the world of web in Higher Education. 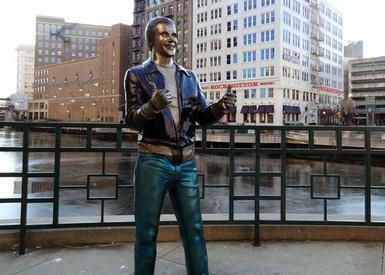 There has to be time to explore the best of what the host town has to offer whichis why we recommend you high-tail it down town to have your photo taken with Milwaukee’s favoruite son, Arthur Fonzarelli…Ayyyy! We will be tweeting inspiring thoughts, details on how to win prizes and with any luck the money shot of us and the Fonz so be sure to follow us @TERMINALFOUR. See you all there!